Thermal jackets that are windproof, water beading and breathable, with cold stop cuffs and elasticated back waist. They are available in S to XXXL. back pockets, including a zippered one, to have tools and personal items always at hand. Sizes range from S to XXXL. 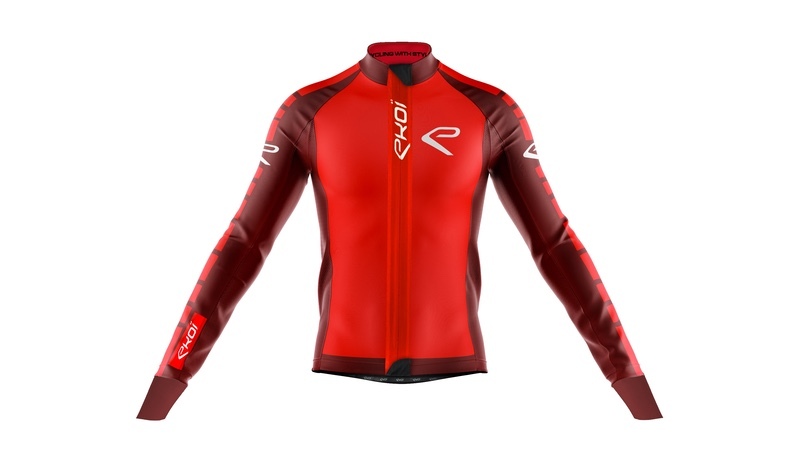 Both the jersey and jacket are available in six different colours/styles. Thermoroubaix bib tights are available in black only and feature a two-toned fibered Lycra capturing the winter lights and reflecting shades of green, red or silver on the black surface. The pad is EKOÏ’s exclusive GEL PAD, made with a medical-grade shape-memory gel. The fabric integrates real carbon fibres, for moisture and sweat wicking across the pad surface.